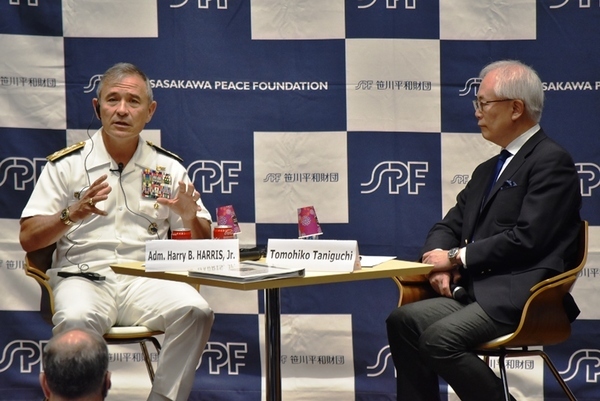 On May 17, 2017, the Sasakawa Peace Foundation hosted Admiral Harry B. Harris, Jr., Commander of the United States Pacific Command (USPACOM). Admiral Harris is the 24th Commander since the USPACOM was established in 1947. He was born in Japan and reared in Tennessee and Florida. Following graduation from the U.S. Naval Academy in 1978, he started designation as a naval flight officer (NFO). He commanded Joint Task Force-Guantanamo, the U.S. 6th Fleet, Striking and Support Forces NATO, and the U.S. Pacific Fleet, and has served in every geographic combatant command region. His graduate education focused on East Asia security. He attended Harvard's Kennedy School of Government, Georgetown's School of Foreign Service, and Oxford University. He was also a MIT Seminar 21 fellow. Recently, we have seen the growing threat of North Korean nuclear and missile development, and tension between the United States and North Korea has increased. Looking at the current security environment in East Asia and Asia Pacific, Admiral Harris spoke about the role of Japan-U.S. Alliance, US strategy, and the prospect of the regional stability. Moderator was Dr. Tomohiko Taniguchi, professor of Keio University. The Sasakawa Peace Foundation Bldg. Admiral Harry B. HARRIS, Jr.
We have closed the application because there is no more seat available. Should you wish to participate, please fill out the application form from this page by 17:00 on Tuesday May 16, 2017. * Seating is limited and will be allocated on a first come, first served basis. * Please kindly be noted that we do not offer parking area.